The Minnesota Vikings’ hot start was just good enough to pull off a 38-30 win over the Washington Redskins on Sunday. With Case Keenum at the helm, the Vikings put up 21 points in the second quarter alone, to take a 28-17 lead into halftime before eventually pushing their lead to 35-20 heading into the final quarter. Due in large part to two second-half interceptions from Keenum, Washington was able to climb back into the game, but their efforts were too little, too late. Fueling the Redskins’ second-half surge, quarterback Kirk Cousins punched in three touchdowns (two rushing) on top of his 327 passing yards. Veteran tight end Vernon Davis and wide receiver Jamison Crowder led the team in receiving with 74 yards apiece. While Vikings’ Stefon Diggs had his fair share of highlight plays, his running mate Adam Thielen stole the show. Thielen recorded eight receptions for a season-high 188 receiving yards and one touchdown on the day. With that, we give you our PFF exclusive takeaways from the contest for each team. 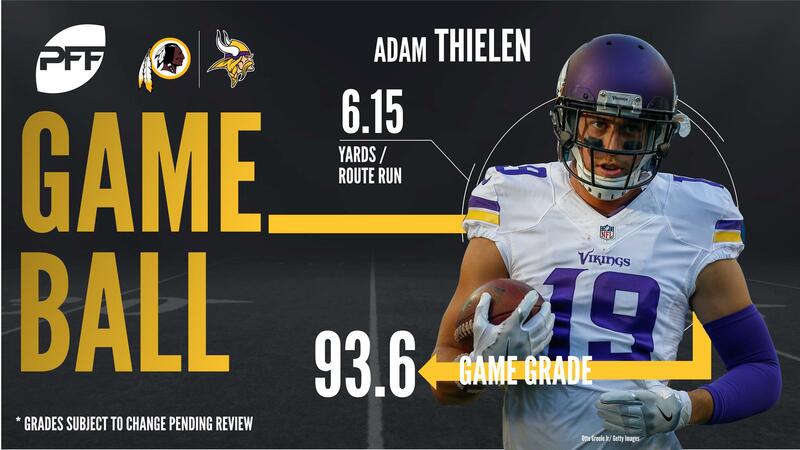 Thielen had another strong game as he caught 8 of his 11 targets for 166 receiving yards — including 72 after the catch — and a touchdown. Furthermore, quarterback Case Keenum had a passer rating of 145.1 when targeting Thielen in this game. In addition, the Minnesota receiver once again showcased his toughness by making several contested receptions when he was hit immediately after catching the football. Even though Keenum led the Vikings to a win against Washington, the former Houston quarterback had a mixed outing on Sunday afternoon. Keenum excelled on downfield passes as he completed three of his four attempts that traveled at least 20 yards and gained a total of 138 yards on these throws. However, Keenum also made several bad decisions, including his two interceptions where he was late with his throws and did not see safety D.J. Swearinger closing in on his intended receiver. In addition, Keenum struggled under pressure as he gained just 2.7 yards per pass attempt and had a passer rating of just 12.0 when the Washington pass rush got to him. Continuing a strong season, Smith was once again one of the best players on the field against the Redskins, racking up seven tackles, with two of those resulting in a defensive stop. In coverage he made his presence felt with several big hits, including one that forced an incompletion in the end zone. Johnson has been impressive as a pass-rusher over the past four weeks, and that continued in this game, with a hit and three hurries from 31 pass-rushing snaps. That was good for a 10.0 pass-rushing productivity rating, which ended the Sunday early games as one of the top marks by a player on the defensive interior this week. Playing his first snaps of the season, the 2016 undrafted free agent was third among the wide receivers on the team with 41 offensive snaps, catching two of the three passes thrown his way for 50 yards. That included arguably the catch of the season, with Harris reaching back with one hand to snag the ball. That catch alone should encourage the Redskins to throw the ball his way more. Showing his all-round ability, Thompson delivered as a receiver, with six targets over the course of the game. He picked up three receptions for 41 yards, including a long reception on fourth down against Eric Kendricks. As a runner, he saw nine carries, with one missed tackle. He rushed for just 26 yards, but 30 of those came after contact. Even though he started slow against Minnesota, Swearinger basically single-handedly brought his team back into the game in the second half. The Washington safety read Case Keenum’s eyes to beat Kyle Rudolph to the football on a corner route in the third quarter and then undercut Rudolph on a quick out on the first play of the fourth quarter to bring the football back to the goal line. Furthermore, Swearinger had an impact in the run game as well since he made several tackles close to the line of scrimmage. While Washington was unable to sack Case Keenum, it was Smith who got closest to it as he racked up a total of three pressure on just 18 pass-rushing snaps. In addition, Smith was the only player who knocked down Keenum as he forced an incompletion by hitting the Minnesota quarterback’s hand during the throwing motion. Furthermore, Smith was also among the best Washington run defenders as he set the edge and dominated the Vikings’ tight ends on run plays.